This is one of those chicken topics where everyone has an opinion, and their opinion is always right! Heating the coop has always been a source of endless discussion among chicken folk. Old timers will tell you that you don’t have to heat the coop. However, there are occasions when heat is appropriate. The recent innovation in coop heaters has been a blessing. For years people relied on brooder lamps alone. These can be dangerous things to have in a coop filled with dust, feathers and flying creatures! These are my favorite type of heater. They are safe and inexpensive to use, and are also easy to install. They look a bit like a flat screen TV; they can be fixed to a wall or left free standing. A flat panel will not heat the entire coop, just a small area so placing it near the roosting perches will provide the most benefit. This is an infra-red heater that can be hung overhead or fitted on side mounts. Like the flat panel heater, this will only heat a small area. 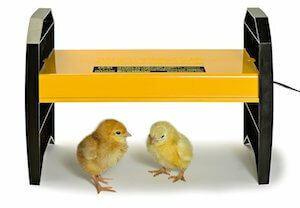 Sweeter heaters are simply and safely designed for use in the coop or in the brooding pen. It would be most effective hung near the roosting perches. This too is easy to clean; it is a sealed unit and comes with a 3 year warranty. It is a little bit more expensive than others mentioned here, but is well worth the money if you are going to use it frequently as a brooding lamp. 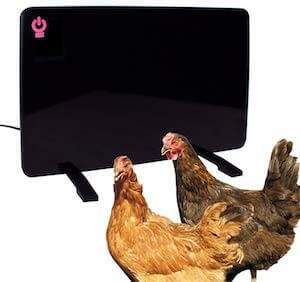 This is another safe space heater that is suitable for a chicken coop. 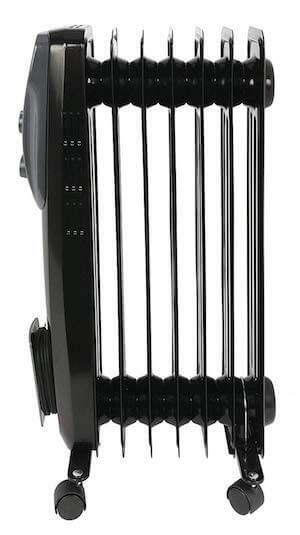 These are not as economical as other heaters to run, however they are cheaper to buy. I have used one of these and it did a reasonable job of heating a small coop. A large coop would not have benefitted and it would have been costly to run. One drawback here is that they are fiddly to clean after use. If you are brooding chicks through the colder months you will need to use a proper brooder such as an ‘electric hen’ or a brooding plate. There is a large variety of shapes, designs and prices to choose from. Please remember though, if you use one of these plates, the brooding area must be draft proof of the chicks may chill and die despite your heater. If you’re worried about the cost to run, many brooding plates are automatically set to turn on at 35°F and off at 45°F. Some folks still use a brooder heat lamp to heat coops in the winter. I cannot say strongly enough that this is a dangerous practice that can cost the lives of your birds, destruction of the coop and possibly worse. When you put a hot light bulb in a room that is filled with straw, feathers and dander the chances of an unhappy ending are very high. The amount of heat put out by these lamps is really too much for a chicken coop. If you have no other choice, a simple light bulb will work effectively to heat the coop. A 40w light bulb will put out enough heat to raise the temperature a few degrees for the birds. You must ensure that it is well secured and cannot fall and come into contact with combustible materials. It also needs to be out of the way for flying birds! Again like the brooder lamp, I really don’t recommend this as it is a fire hazard. If possible, you should add some sort of insulation to your coop. You can use a foam-board, insulating bat, even cardboard, feed sacks or shredded newspaper will help. 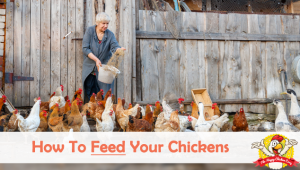 Ensure you cover all insulation with wooden boards or other peck-proof material otherwise your chickens will eat the insulation. It is not good for them or your cash flow! Increasing the amount of bedding for the floor will help with insulation too; straw and hay have a lot of air pockets that stay warm. One thing to always remember is space. If you have four hens sitting in a large coop it leaves a lot of empty space to heat. Look at ways to reduce the overall size of the room, or can you move them to smaller quarters for the winter? 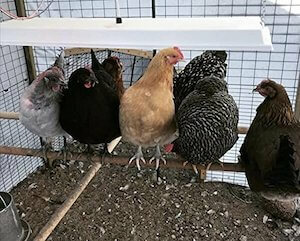 Blocking off part of the coop can reduce the area that needs to be kept warm; ways to reduce the size of the room could include things like partitioning off parts of the coop with plastic sheeting. Please do not stack straw bales inside the coop; they can become moldy and toxic to your birds. Outside around the coop is acceptable although it will attract vermin. 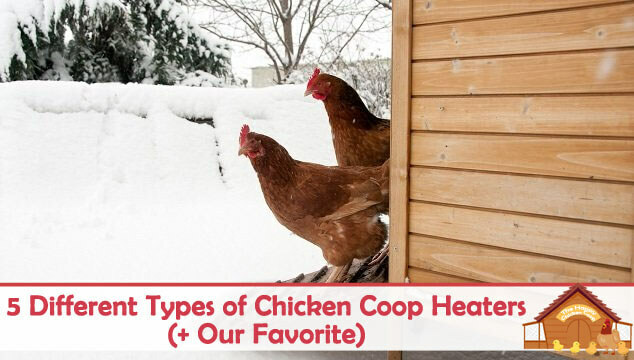 When Should You Use a Coop Heater? The vast majority of chickens can shake off the cold much better than us humans; after all, they do have a superb down coat! While us feeble humans are dressed in four layers of clothing before we even get out of bed, chickens will be up and positively happy while the mercury slides ever downward. 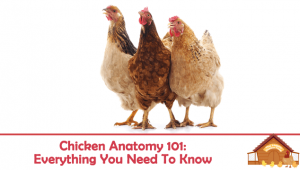 A chickens’ core temperature normal runs between 105-107°F; a baby chicks’ temperature is slightly lower at 103.5°F. It will rise as the chick matures until it reaches adult levels. As you see, they are ‘hot stuff’ to start with; their metabolism is much different to ours. In preparation for the colder months, chickens will molt, growing in a new set of feathers to keep them warm and insulated during those bitterly cold months right after the winter solstice. Those feathers will be fluffed up to keep warm air trapped against the body and they may huddle together for warmth. In the coop overnight, it has been estimated that each hen puts out the warmth of a 10w light bulb, so they do generate a small but consistent amount of heat for themselves. If you give them a small amount of scratch grains or cracked corn before bedtime, they will generate a little more warmth from processing the grains during the night. The coop needs to be draft proof and well ventilated. Chickens need to be able to get out of drafty areas as the draft will compromise their ability to keep warm. If you need further advice read our winter care guide. Ventilation in the coop is also essential. To judge when you should heat the coop, you need to watch your chickens. If they seem content to go about their business normally, have no signs of frostbite and are socializing with each other, they are doing fine. If they seem lethargic, are off food and water and reluctant to move – it’s time for a little heat. 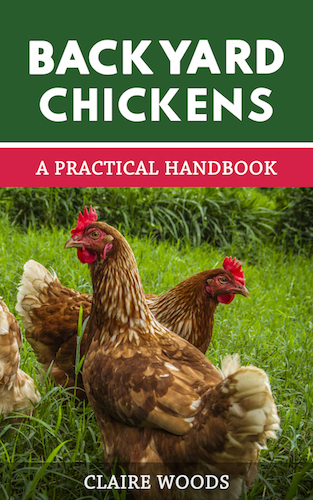 Chickens that may be considered exceptions to the rules are birds such as Frizzles and Silkies, tropical breeds such as jungle fowl, sick or ailing birds and chicks. Frizzles and Silkies have a really hard time staying warm with those funky feathers. The feathers do not sit against the skin so the insulation factor is severely compromised for them. Recently imported Jungle fowl have a hard time acclimating to a cool climate because they are born to live in a hot, humid environment. It will take time for them to acclimate to your weather. Fully feathered chicks should be fine without heat. They are young and healthy and can tolerate the cold well. If you have chicks that are still feathering out, try to maintain their ambient temperature at around 60-65°F until full feathered, then turn off the heat. If they are new hatchlings, they need to be kept in brooder conditions. There are some things to look out for when heating your coop (apart from the obvious fire hazard). Your chickens can survive bitterly cold weather (down to 0°F). When you heat the coop you need to be aware that if the power goes out and you have a quick drop in temperature in the coop – your hens may die because they cannot cope with the sudden drastic change. When you increase the heat you will increase humidity. This increases the chance of frostbite to birds with large combs and wattles. Remember, your coop doesn’t need to be tropical. It should not go below 32°F but it doesn’t need to be any higher than 40°F. I don’t want to use a heater, what else can I do? Insulating the coop will help tremendously. Make sure there aren’t any drafts too. Check out our other ideas for heating the coop in the section above. My hens are sleepy and aren’t eating, what’s wrong? 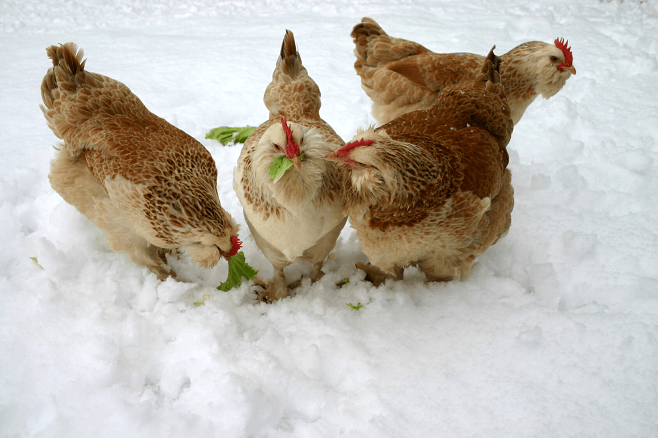 Your hens may have a low body temperature or hypothermia. Take them into a warm place for a few hours and see if they improve. If they start getting active and eating, you need to heat the area they are kept in. My hens have frostbitten combs, should I raise the heat? No, heat is not the problem, moisture is; you need to better ventilate your coop. See our article on coop ventilation here. The key is to remember that too much heat can also be detrimental to the health of your birds. 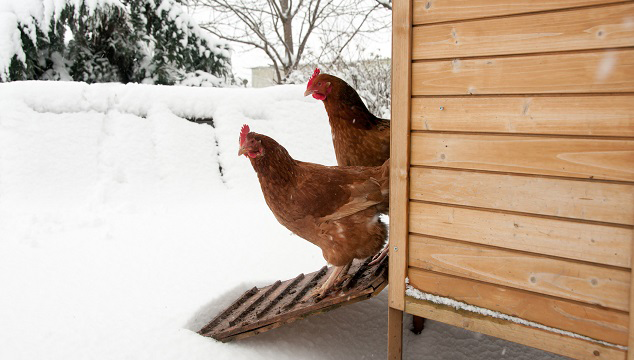 Just because you are almost frozen to the spot, doesn’t mean it will affect your chickens the same way. The birds are in a dry, draft proof area, they have food and water so they don’t really need to go outside, but they will. For an expedition outside the coop, they are well equipped; a cozy set of feathers insulating them against the arctic air. If you were to hang a thermometer in the coop, the temperature will almost always be warmer than outside – my coops have never been below 32-34°F even in the coldest snap of winter. So remember, heat the coop for the comfort level of your birds, not your comfort level! They are two entirely separate things! Lastly, buy the best, most safe and durable heating items you can. You may need to use them time after time and if you have a safe and reliable unit you can sleep easier at night. I’m thinking about heating our coop, because we have one chicken…she’s a rescue, and special. Because she’s only one, I really feel she needs a little heat…no other fluffy butts to snuggle with. You need more than one chicken. That’s just cruel to keep her by herself. If she’s the only one she needs to be in the house. 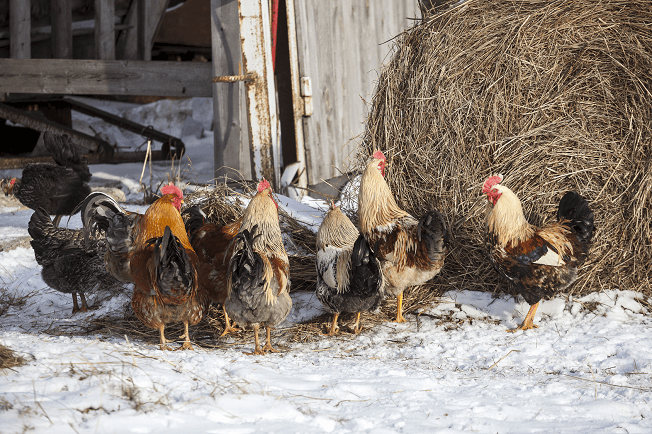 What breed of chicken is best in cold weather like Vermont? Most flat panel heaters will have thermometers built in so they will come on/off automatically. Thanks so much for your information. This is my first winter with chickens and I have been using a red heat lamp so far (it was 17 degrees F this morning). Even though I have it mounted as safely as I can, it made me nervous but I didn’t know what else to use. Today I ordered the flat panel heater, it was relatively inexpensive on Amazon and I should have it in two days. Thanks for helping me keep my girls safer! I see you suggested using foam board as insulation. That is fine if it is on the outside and covered with plywood or siding of some sort. I made the mistake of putting the foam board on the inside of the coop and they have eaten up as far as they can jump! THEY WILL PECK IT AWAY! Beware!!! It is 12 degrees this morning in my chicken coop, and the temp is supposed to get down to 0 this week. The chickens were all acting normally this morning. No frostbite on any of them. I have four who have decided to start molting in the last couple of days. To heat or not to heat? ?